Long ago in Israel there were enemies in the areas which today we call Gaza and Syria and Lebanon. Gaza had the older enemy, the Philistines, an Egyptian offshoot community which arose from Egypt separating soon after the Israelites arrived and conquered Canaan or a remaining Canaanite tribe which survived the Israelite advances for quite some time. They were capable warriors who used variants of Egyptian fighting methods as the Canaanites had been vassals of Egypt and were often included in Egyptian campaigns against the Hittites who ruled much of the lands north of Canaan. Their units would include chariots with archers as well as spear and sword men as well as drivers. This required slightly larger and heavier chariots which were equally hearty and difficult to destroy in combat. They also used heavy and light infantry, standing archers and slingers and limited horse cavalry. This made them a very formidable enemy for the Israelites who relied heavily on infantry, mostly light infantry which would utilize geological landscapes to great advantage. During their series of wars the Philistines had the distinct advantage in the flatlands while the Israelites fared better in the Judean hills and mountains. These hills and mountains rendered the chariots unusable and limited the advantages for horse cavalry. Hills and mountains also would wear out heavy infantry rather quickly as their heavier armor, shields and weapons rendered then exhausted while the Israelite light cavalry moved well and was very familiar with these lands. Still, often the Israelites fared well even on open flatlands against the Philistines, especially when under the rule of King David and King Solomon. David had a particular knowledge of the Philistines having lived and fought amongst them with a group of close friends and followers while hiding from King Saul who wished him dead. In the end it was Saul who committed suicide after his son was felled in battle which was ill advised and proved disastrous for the Israelites. Following the death of King Saul, David rose to the crown amid great celebrations and fanfare. Initially David made peace with the Philistines but that peace fell apart and a great war ensued. Eventually mention of the Philistines vanished with little explanation and their tribe was subsumed by other tribes and the Philistines simply ceased to exist. The Philistines have absolutely no genetic or other ties to the Arabs claiming their heritage from this Biblical tribe. Another influence on the Philistines was our other group, the Phoenicians. This was thought due to their seafaring economy and types of ships. Either way, the animosities between the Philistines and the Israelites was obviously due to their both being very capable and strong tribal communities and being neighbors naturally led to incursions and their inevitable conflicts. The others were the Phoenicians who too were one of the stronger Canaanite tribes with Egyptian ties. The Phoenicians were the great maritime and commercial traders sailing the eastern Mediterranean Sea (Great Sea). There were also found to be some Hittite influences and possible interbreeding between the two civilizations in the early periods in Phoenician history. One of the most lucrative trade items they dealt in was a deep purple, a royal purple, dye necessary for robes of royalty as well as the Israelite Priests and many garments of the Tabernacle and later the Temple. 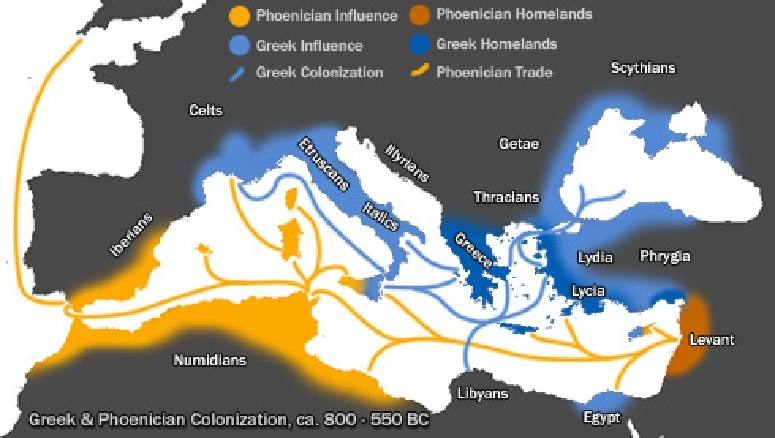 The Phoenicians were eventually pressed by the invading empires of Babylonian, Persia and Greece that they took to their ships and settled in Northern Africa, some claim they became Carthage, and traded with people as far as the British Isles. History lost the Phoenicians per se and if they became Carthage they were exterminated with the remnants strewn across northern Africa or enslaved by Rome after the Punic Wars. The Phoenicians also warred with the Israelites with varying results over the years just as the Philistines had done though they survived beyond the Greek conquest and enslavement of the Israelite Tribes. The Babylonians had conquered and took us from our lands while the Persians, Greeks, Assyrians and initially the Romans simply ruled over us in our lands. There was one consistent reason for our defeat each and every time, infighting between the different tribes, political divides, different sects or whatever divisions which kept us infighting when we needed to be united to save our homelands. The Persians also had a large number of Jews decide they preferred living remaining in the cities which had been Babylon, moving to the capital or other large Persian city, anywhere but under Torah and living as one people in one land. This may have been a contributing factor to subsequent losses and leading eventually to the great Roman dispersion spreading us to the far corners of the Roman Empire and everywhere between all in all as slaves with no rights and an expectation that our culture and people would perish. This was how the Romans destroyed the remnants of the Phoenician Empire when they destroyed Carthage and dispersed their survivors. That was the end of any mention of Carthage, Carthaginians or Phoenicians in the rest of history. The Romans not only dispersed the Israelites, by then the Judeans, resulting from the great division of the Israelite nation into Judea and Israel, of which Israel and its Ten Tribes were conquered by the Assyrians and disappeared from history until being found in tribes from the far corners of the globe, and the Romans took care of the remainder, or so they thought. The twelve distinct tribes were ruled separately with their sharing of the Priestly tribes amongst them as their common thread. 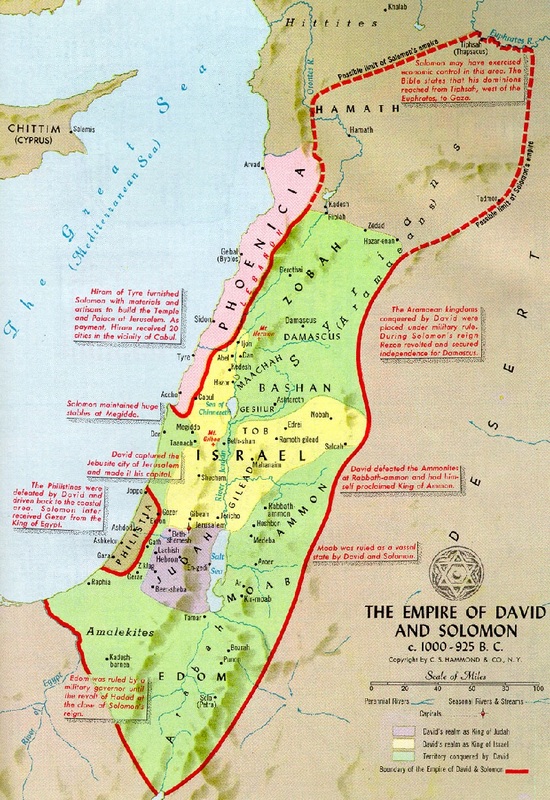 They were finally unified under King David starting the Israelite “empire” and made a great power with King Solomon (see maps below). This divide resulted in two kingdoms, one took the name Israel and the other took the name of its predominant Tribe between Benyamin and Judah thus became Judea. The name Judea was eventually shortened until the remnants of the Tribes of Judah and Benyamin along with their priestly classes simply became Jew. 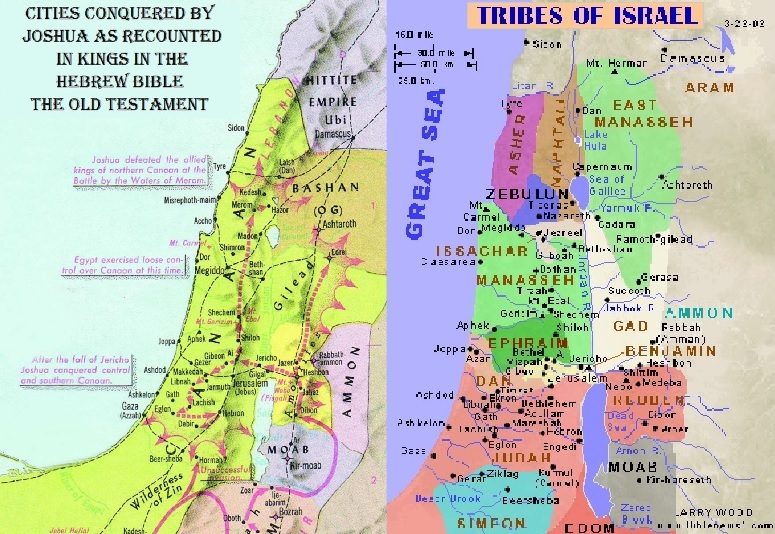 After the Assyrians capture the ten tribes of Israel they disappeared from Biblical history and many feared they had assimilated completely into the peoples with whom they settled. This may explain why today we are finding tribes claiming to be Jewish who genetically have many of the marker genetic makeup which has historically been defined as being an Israelite descendant. Further explaining such was the Roman dispersion which went further than the far corners of the Roman Empire as Jews were also sold to neighboring countries and empires such as India, China, Mongols, Arabs, Egyptians, and even the European and African barbarians plus escaping enslaved Jews would immediately target the closest non-Roman tribes they could find. The miracle was that for the large part the Jews kept themselves fairly separate once there had risen a Jewish community. It is even assured that many a Jewish parent would send to distant relatives or known Jews who may have resided in proximity in order to have their children marry within the faith, within our peoples. The Assyrians and Romans as well as the Babylonians all conquered a divided people too stubborn to work together to resolve differences and agree on the best and strongest means of representing the entirety of the Jewish People. The divisions often were over trivial matters or vital matters where Torah interpretation was always a critical matter which often went unresolved while manner of worship, sacrifice, or other religious obligations were minor items which should have easily been resolved. The reality was that all too often in Jewish history, Israelite history, was that we allowed divisions in our family and this led to our destructions. Under Roman rule we could not have been a more divided people with groups proclaiming their leader was the Messiah and all of them proved to be wrong. Even Rabbi Hillel falsely believed that Bar Kokhba was the Messiah, something for which he paid a horrible price as did many others after that rebellion was squashed by Roman legions. We defeated ourselves throughout history yet when we were united we proved to be formidable. Just look above at the conquests by King David and then King Solomon who reached the Euphrates River in what is today northern Syria almost in Turkey. We suffered from such weakness being self-inflicted throughout three thousand years of history with only a few bright spots where it took a Moses or Joshua, it took King David and King Solomon and after each of these pairs we fell into fighting ourselves again. One would think that as smart as we are presumed to be we might have finally learned. Nope, we have not learned anything. Sure we were kind of united in 1948 once the Haganah, the Irgun, the Sternists, Lehi and other splinter groups realized it was fight as one or die individually. 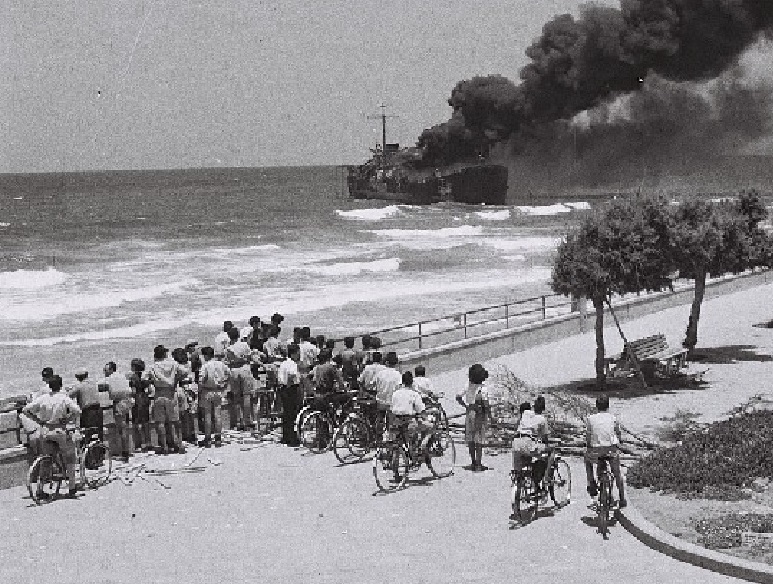 Even then there was the wasteful and unnecessary destruction of the Altalena due to a struggle over power with David Ben-Gurion opposed and attempting to suppress Menachem Begin and, in absentia, Ze’ev Jabotinsky which resulted in the shelling of the ship the Altalena off the Tel Aviv beach (see image below). That was the second confrontation between Irgun and Haganah branches of the newly forming Israeli Defense Force during the 1948-9 Arab genocidal intended invasion where they conquered and illegally occupied Judea, Samaria (Jordan) and Gaza (Egypt). In future wars up through the June 1967 Six Day war, a response to overt moves and imminent invasion by Egypt and Syria under the orders from Egyptian President Nasser with assistance from Syrian Dictator Assad. When Jordan joined the fight the next day over pleading and warnings from Israel, the Israelis appeared surrounded but broke through and ended this attack rather rapidly liberating Judea, Samaria and Gaza and gaining the Sinai Peninsula and Golan Heights from Egypt and Syria respectively. Even though the October 1973 War caught Israel flatfooted and unprepared, the Yom Kippur War as it became known still resulted in an Israeli victory. As per usual, while Israel appeared to be being defeated the world was almost enveloped in an astounding silence but as soon as Israel was almost to Damascus and approaching Cairo the world found their voice and from the United Nations in New York, the White House in Washington D.C., the Kremlin in Moscow and any number of other capital cities, especially across Europe all demanded Israel cease all military activity and return immediately to the armistice lines from the Six Day War as Israel must not be permitted to actually defeat any of her enemies, that would upset the world’s balance. So where do we sit today in Israel. Well, the Arabs have formulated a false flag operation called the Palestinians. Using the Arab Palestinian against Israel instead of the armies of Egypt, Syria (well, not so much Syria now), Jordan, Iraq, Saudi Arabia, Lebanon, Iran and whatever other Arab nation all attacking making Israel the underdog, they use the Arab Palestinians and place them as the poor, unarmed underdogs. With this ploy the Arabs continuously claim ownership of lands sometimes going back to Ottoman Empire deeds. When there is a set of conflicting deeds with one held by any Arab, even one living in America who never even walked this land and the other a Jew who has built a home and has a valid deed, the Arab is almost always considered the owner by the Israeli Supreme Court which leans so far left they may as well convene in Paris and rule as if they were a European Union Court. This has allowed the Arabs to watch as Israel slowly but inexorably eats itself to pieces throwing Jews from their homes, now from entire neighborhoods, all without any real court hearing the claim and ruling on actual ownership. More often than not, when the time comes for a court to actually hear a claimant, the Arab usually drops all claims and all paperwork which once was used to destroy a Jewish life of their home has disappeared into thin air. Does this lead to the Supreme Court reversing their decision, of course it does not. 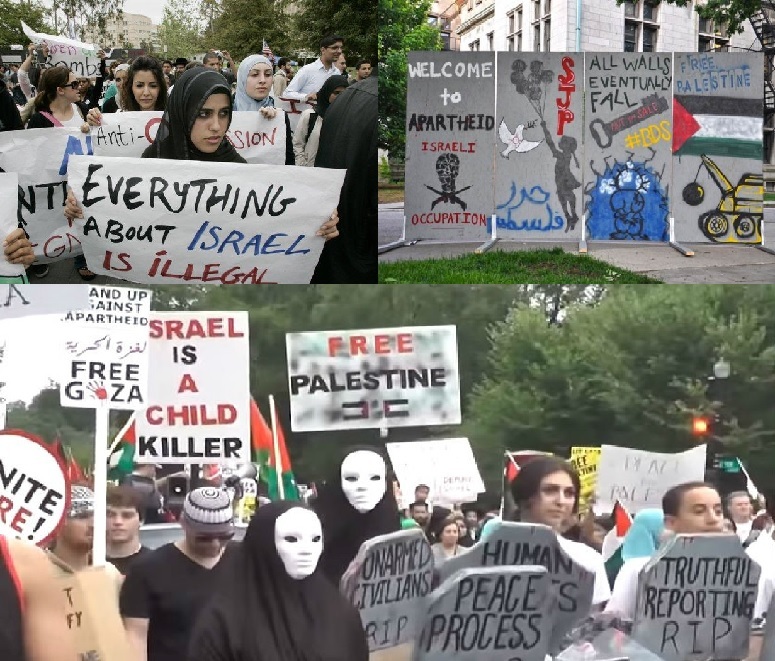 Any Jew thrown off the lands that the leftists on the Supreme Court still believes belongs to the Arabs and no Jew should be permitted to walk there, let alone build a home or community. The Arabs watch as Jews destroy Jewish homes and they riot in celebration. Then the circle starts again usually now with a “Jewish” leftist group such as Peace Now, B’Tselem, Jews for Justice in Palestine, Rabbis for Peace, J-Street and a plethora of other far left Jewish groups many of which are mostly if not completely funded by European governments, the European Union, George Soros, American Jews, and some like J-Street are largely made up of American Jews; all will file often singularly and sometimes in small groups as each time they succeed their funding is increased enriching the leaders of these groups. Once filed directly with the Supreme Court without any need for a court ruling on the properness or even legality of the claim, the Supreme Court jumps to force Jews from their communities. What the claim is these groups are helping the Arab Palestinians who are poor and kept down because Jews are living beyond the Green Line in areas almost devoid of any Arabs or others. The fact that these communities include businesses and manufacturers who employ many Arab Palestinians and when they are shuttered and must relocate within the Green Line the Arab Palestinians they employed lose their employment. These Jewish companies pay premium wages as far as any Palestinian not on the government take is concerned. Arab Palestinian companies pay less than half the going wage paid by the Israeli companies, but by removing these businesses they are helping the Arab Palestinians, especially the ones who were employed there, right? Meanwhile there are often demonstrations within Israel where Zionists protest the destruction of Jewish homes without an actual court decision on who really owns these lands. 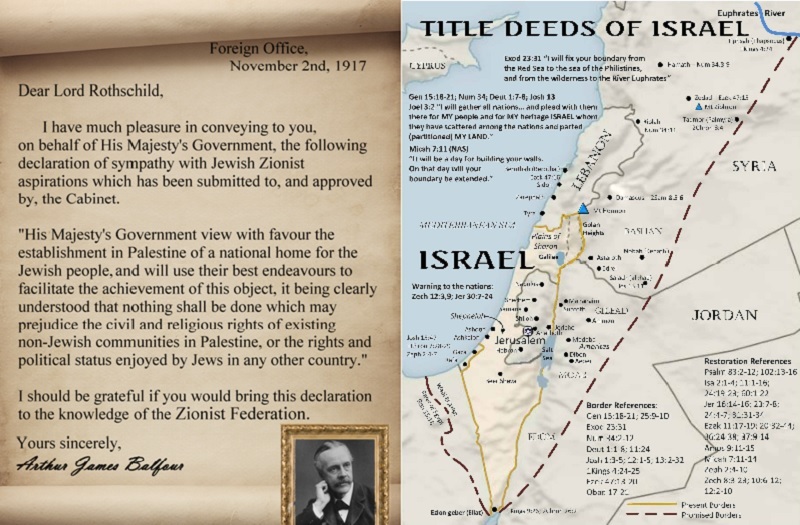 As stated, most of these deeds are either falsely identified, forgeries or actually never existed.There is just some Arab these groups find and pay to tell the court that the identified lands belonged to their family back before the Jews stole the lands. Many of these were denoted as state lands and the Jewish communities went through every required search and received the blessings and even some funding from the government but as soon as an Arab says the magic word, “Mine,” then the Jews must be removed without any further considerations, after all, why would the poor man lie about such an easily proven true or false claim? Maybe because you never validate their claims before ruling the destruction of Jewish communities and even after there is proof from a lower court you still insist your original order be carried out and after the homes and businesses are destroyed you will talk about a review. That almost helps, doesn’t it? The current target is Amona, again. The Israeli government obeyed their Washington D.C. masters and did as President George W. Bush and Secretary of State Condoleezza Rice demanded, destroying over nine thousand Israeli lives and giving all of Gaza to the Arab Palestinian Authority (PA) so they could prove how capable they could be at running a state of their own, and they failed miserably. Never mind they have a semi-autonomous fiefdom around Shechem (Nablus) which they have been misallocating billions of dollars and euros over the years making first Yasser Arafat and his cronies overly wealthy and since his departure Mahmoud Abbas, his three sons and all of his cronies and security detail, without which he would be dead and add in the IDF and Shin Bet foiling a Hamas plot to murder Abbas about every four to six months, but they needed Gaza and it be made Jew-free before they could accept the land. Well, they received the lands around mid-August of 2005 and by June of 2007 after over a year of on again off again fighting Hamas, had finally secured all of Gaza and went about executing any Fatah person not convincing enough in their denial of being a part of the PA and pledging their undying loyalty to Hamas, assuming they lived out the week. Many PA leaders had departed ahead of this collapse and despite training by United States Special Forces under the supervision of General Dayton, all performed out of sight in Jordan, the PA Security Forces were unable to prevent a Hamas takeover of Gaza. The Arabs still only noticed that the Jews were removing Jews for the Arabs to take the land and use it to attack Israel with even more lethal arms including any rocket they get the knowhow to build. Iran has been very helpful in providing Hamas and Islamic Jihad with the plans and motors for even larger and heavier rockets until now they can strike Jerusalem and Tel Aviv from Gaza and possibly as far north as Haifa. Now the Arabs are watching the Jews remove Jews from area after area in Judea and Samaria and they are beginning to envision the total destruction of the Jew using the entirety of the Judean Hills overlooking the heart of Israel and her population and manufacturing and power generation centers. There are desalinization plants, natural gas powered electricity plants, refineries, homes, schools, kindergartens, nursery schools, synagogues and the docks of Haifa, Tel Aviv, Ashdod and Ashkelon all visible from and within easy range of the Judean Hills. On the other side of the argument are the “settlers” themselves backed not only by the Zionists, as one would suspect, but also by a large majority of the people. One might query as to why if the majority, and a clear majority at that, favor annexing most if not all of Judea and Samaria does the elected government not act more forcefully to implement such a solution. Ah, now that is the question. Perhaps, as some of the most ardent Zionists have claimed, Israel just does not have the right government in place and Netanyahu has been so worn down by the friction and pressures that he is simply paralyzed and unable to act according to the desires of the people. That begs why has he been Prime Minister for such an extended period, longer than any other Israeli? This comes down to a single statement in our opinion and that comes from this past election. The last election had many varied and twisted variables. One was V 15 or V 2015 and was a foreign funded and based NGO from the United States at the direction of President Obama whose leader, Jeremy Bird, had been President Obama’s reelection campaign chairman and closely tied to One Voice which was funded by the usual suspects as well as George Soros and registered as if an Israeli based NGO just as so many European NGOs have done to interfere in Israeli day to day political decisions. V 2015 worked to elect the Labor Party ticket and had made some inroads, at least as far as the polls showed. The day before the election Netanyahu made a plea of seeming desperation and as the week or two before the person topping the closest right wing party which might challenge Netanyahu, Naftali Benet, had stated he was unsure if he truly was ready to be Prime Minister. This may have been a play at humility, but what it became was a landslide of Jewish Home voters to Likud in response to Netanyahu who then won with a comfortable margin but marginalized Jewish Home and their ability to affect government. With the United States with direct, though unprotested, White House interference in the Israeli election and to have the Zionist, nationalist, right wing parties still dominate the election, what more proof does it take to know the Israeli public favors annexation of Judea and Samaria and addressing the Arab Palestinian problem afterwards. As near as we have been able to determine from our beachfront town of Nahariya, which is on the Mediterranean coast, we are as settled Israeli as Tel Aviv; but from our sense from people we cross, they are favoring a one state solution with the Arabs permitted limited autonomy or simply being bought out and encouraged to leave and settle elsewhere as wealthy people if that is what it would take. There is the feeling that any solution requires the removal of Mahmoud Abbas, his cohorts and henchmen, otherwise known as the PA Security Forces and particularly Force 17. Then there would need to be fair and open elections which Israel would need to monitor and, in order to satisfy a suspicious world, United Nations, European and United States and maybe Russia and China and who knows who else, but not the Arab League, to monitor the fairness and openness of the elections, something completely missing in any votes taken currently. It is possible that many Arab Palestinians would enjoy the freedom and opportunities for economic growth and freedom from oppressive governance that Fatah used in Judea and Samaria and Hamas oppresses in Gaza. Gaza, unfortunately, is beyond help unless Israel, the next time thousands of rockets rain down each week, possibly daily, out of Gaza simply cleanses Gaza of all terror related rocket and weapon factories, storehouses and the people involved in such activities once and for all and allows them an open and semi-autonomous region and assistance in economic recovery. Oddly enough, granting the Arab Palestinians the opportunity to become economically viable and independent from their dependence on charity from throughout the world and the graft that produces and the other sins soon attached, is something the United Nations, European Union, many European governments, the United States State Department, the Arab League, Iran, the Muslim Brotherhood and who knows who else, would fight against with all their might as they enjoy their power to attack Israel without any direct ties or involvement. The world will eventually have to realize, Israel has been reestablished and is going to remain against any and all odds. But what are the world’s Jews doing about all of this? We are fighting one another and beating our heads together for no solution. Our stance explained in the following is favoring the Zionist arguments as that is where we place ourselves. The solution is for a single state owned and protected by the IDF with the Arab Palestinians enjoying their semi-autonomous rule within Areas A and B while Israel settles Area C and the Jordan Valley, period, end of discussion. There is a great need for revamping how Justices are chosen for the Supreme Court and after that every other court of civil law. There needs to be a drafting of a Constitution which iterates the make-up of the government, what powers are vested where, the procedures for making a law and limitations on adjudication such that there cannot be any legislating from the bench. Judges apply the law using the letter of the law and not some dreamed up insanity that no normal human being could dream came from some law. That is what is needed and with this the annexation of all of Judea and Samaria. Any Arabs desiring of leaving, there will be a buy out of your property and a generous benefit package to assist with your relocation along with finally a free airline first class trip to whatever nation is accepting you. We will wish you luck. From the semiautonomous region ruled by Arab Palestinians we only demand that you obey the Noahic Code and not pursue violence against Israeli citizens. Should this advisory not be heeded then we will assume you have decided to wage a war of separation which will result in a complete and total response by all of the forces short of nuclear weapons required to decimate all of the area, structures, homes, businesses, wells, charcoal mounds and people in a conflagration which will not soon be forgotten by those watching. We, on the other hand, will simply return to living happily either before such an episode and it not being required or afterwards safe in the knowledge that there is no longer even a hint of a threat from former members of the PA, period. All of the alternatives will be of your choosing and we have explained our responses, you decide. Thank you in advance for your participation.